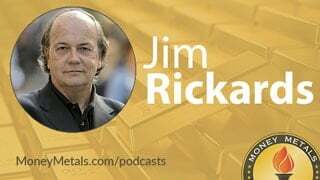 Coming up we’ll hear part one of an amazing two-part interview with Jim Rickards, author of Currency Wars, The New Case for Gold and The Road to Ruin. Jim shares his insights on the Fed’s supposed plan to unwind its balance sheet and what it will mean for the economy and for gold prices. He’ll discuss some potential fireworks involving the U.S. dollar as it continues losing its reserve currency status. Don’t miss a must-hear interview with Jim Rickards, coming up after this week’s market update. Beaten down gold and silver markets showed signs of recovering late this week as prices have risen above recent lows. Mining stocks are rallying strongly, pointing to upside potential for metals in the days ahead. As of this Friday recording, gold prices come in at $1,256 an ounce, unchanged since last Friday’s close. The silver market is also flat on the week with spot prices currently coming in at $16.74. Platinum is off very slightly at $932 an ounce. While palladium, which was outperforming again through Thursday close when it posted a new high for the year, is off 2.5% so far today and is now down 0.5% overall this week to trade at $869. All of the precious metals are outperforming crude oil this year. Oil prices took another dip earlier this week on concerns about over-supply. The glut has persisted despite OPEC’s vows to cut production. The longer prices persist below $50 a barrel, the more non-OPEC producers will also have to hunker down. Many shale and offshore drilling projects that came online a few years ago are simply uneconomic at today’s prices. By next year things could look quite different in the market for crude and other commodities. Despite a surge in sales of electric vehicles, global demand for oil will continue to rise. The U.S. Energy Information Administration projects the world will use 100 million barrels of oil per day in 2018, up from 98.5 million this year. Demand for industrial and precious metals will also rise. But the beleaguered mining industry will have difficulty meeting it. In 2018, we could be facing record supply deficits in copper, silver, and other metals. For now, low commodity prices are fueling a low inflation storyline on Wall Street. While it may be nice for consumers to be able to fill up their vehicles with cheap gasoline this summer, it’s a relatively small savings within most family budgets. Low prices at the pump won’t offset rising rents and skyrocketing health insurance premiums. The inflation rate on Obamacare plans is running well into the double digits, with some states facing the prospect of not having coverage available at any price. Republicans gained control of the White House and retained control of Congress in 2016 on a pledge to repeal and replace Obamacare. On Thursday, Senate Republicans rolled out their proposed healthcare reform bill. Unfortunately, it does next to nothing to actually reform the system in a way that would bring down costs. Instead, it props up the failing system with more subsidies to insurers and to individuals who would otherwise be priced out of the market. Senator Rand Paul is leading a conservative revolt against the bill. Sen. Rand Paul: The most important thing is we promise to repeal Obamacare. The current bill looks like we're keeping large parts of Obamacare. In fact, one of the architects, Jonathan Gruber has come out saying, "Hooray! It looks like they're not really repealing Obamacare," and I think he's probably accurate. We're keeping the subsidies. We're boosting the subsidies for stabilization or risk pools, and I think it looks a lot like Obamacare. Critics of the bill are dubbing it “Obamacare lite.” But a full repeal and replace bill looks politically impossible to achieve. There are too many vested interests in keeping the system propped up. Among them are health insurers and pharmaceutical companies. Clearly, they liked the bill the GOP Senate produced. The healthcare sector of the stock market surged 4% this week. None on Wall Street dare call it inflation, but that’s exactly what the government is doing – artificially inflating healthcare assets and prices by pumping the sector with subsidies borrowed into existence with the help of the Federal Reserve. One upshot for investors if the bill passes is that it boosts the amount they can contribute to Health Savings Accounts to match the deductibles on high-deductible health plans. That would translate into an annual HSA contribution of up $6,650 starting next year, maybe more if deductibles rise. It is possible to invest your HSA and IRA in precious metals and other inflation resistant assets. Lately, the stock market has served as the primary outlet for inflation. The bull market cycle has stretched longer than normal, but it won’t last forever. When falling stock market values, rising healthcare costs, and rising commodity prices all hit simultaneously, it will be a financial disaster for individuals who aren’t well diversified into hard assets. Mike Gleason: Absolutely. Well first off, Jim, last week, the fed increased the fed funds rate by another quarter of a point as most of us expected, but during that meeting, we also heard Janet Yellen say she wants to normalize the Fed's balance sheet, which means the Fed could be dumping about $50 billion in financial assets into the marketplace each month. Now you've been a longtime and outspoken critic of the fed and their policies over the years. So, what are your thoughts here, Jim? Do you believe they will actually follow through on this idea of selling off more than $4 trillion in bonds and other assets on the Fed's books. And if so, what do you think the market reaction would be including the gold market? Jim Rickards: Well, I do think they're going to follow through. Of course, it's important to understand the mechanics of the Fed. They're actually not going to sell any bonds. But they are going to reduce their balance sheet by probably two to two and a half trillion. So just to go through the history and the math and the actual mechanics there, so prior to the financial crisis of 2008, the Fed's balance sheet was about $800 billion. As a result of QE1, QE2, QE3, and everything else the fed has done in the meantime, they got that balance sheet up to $4.5 trillion. By the way, if the Fed were a hedge fund, they'd be leveraged 115 to one. They look a really bad hedge fund. But that's how much the Fed is leveraged, they have about 40 billion of equity, versus 4.5 trillion of assets. Mostly U.S. government securities of various kinds. So they're leveraged well over 100 to one. And if you mark the balance sheet to market, not always but sometimes depending on what interest rates are doing, they're actually technically insolvent. There have been times, again not all the times, but times when the mark to market basis, the Fed would have negative equity or basically would be broke if they were anyone other than the Fed. So that's how leveraged they are. That's how bad it is. Now, what they want to do is to get the balance sheet down to what they consider normal. Now normal is completely subjective. There's no rigorous scientific formula for what's normal. The way you would do it is go back to 2008, start with the 800 billion, and say well look, if we had grown the balance sheet on the prior path, where would we be today in 2017, going into 2018, 2019? That number's around two trillion. I mean it wouldn't have been 800 billion. They're not going to hold it steady. But probably just two to two and a half trillion for an approximation, which means that they have to reduce the balance sheet by two trillion dollars or more to get back to normal. Now the question is, how do you do that? And again, I just want to emphasize, they're not going to sell any bonds. What they do is they let them mature. If you want to go buy a treasury bond, let's say we bought a 5-year note, five years ago and it was maturing today. What would happen? The Treasury just sends you the money. It's like any bond. You don't have to sell it. You don't have to do anything with it. They just send you the money. They have your account and the money just shows up in your account. Well, it's the same thing with the Fed, they have all these trillions of treasury notes and bonds and bills and mortgages and all that. And when they mature, the Treasury just sends them the money. So if that's true, which it is, why hasn't the balance sheet been going down all along? Well the answer is, they have been reinvesting the proceeds. So, as I say, if you have a 5-year note you bought five years ago, it matures, treasury sends you the money. Well the Fed has been going out buying a new 5-year note to replace the 5-year note that just matured. So that holds the balance sheet constant. During QE, they were actually doing more than that. They were not only rolling over the existing balance sheet. They were buying new securities with money from thin air. That, by the way, for listeners who may not be familiar, that is how the Fed creates money. So, the Federal Reserve calls one of the so-called primary dealers which are the big banks. It's Goldman Sachs, City, JP Morgan, the usual suspects. And they say, “offer me 10-year notes or 5-year notes, whatever.” And the dealer will offer them a price. And the Fed will say, "Okay, you're done." And then the dealer delivers the treasury notes to the Fed. And the Fed pays for them. But the money comes from nowhere. If you or I called Merrill Lynch of Goldman Sachs or somebody and said, I'd like to buy some 10-year treasury notes, they would sell them to us, but we'd have to pay for them with real money. I mean the money would come out of our brokerage account or a bank account. Whereas when the Fed does it, they just say, "Here's the money." And it literally comes from thin air. So that's what Quantitative Easing was. That was printing money to buy bonds to build up the balance sheet. And then that money went into the banking system. Of course, all the banks did was give it back to the Fed in the from excess reserves. On which they got interest, so the whole thing was just a way to funnel earnings from the treasury to the banks at the tax payers expense without anyone knowing. I mean obviously, technically I just described it, but this is not something that the everyday American necessarily understands that well. So, that's what QE is, and this is now the opposite. And the name for it is quantitative tightening. So, when they were printing money, it was Quantitative Easing. Now that they're making money disappear, that is what happens, it's Quantitative Tightening, so we call it QT. So we had QE1, QE2, QE3. Now we're going into QT or quantitative tightening. Now this does make money disappear. It's the opposite of creating money. So again, simple example. The 5-year treasury note on the Fed balance sheet, it matures. The Treasury sends you the money. Now what they're going to do, Mike, this is what you referred to, instead of going out and buying a new one to roll it over, they do nothing. And then the money disappears, the bond disappears, because it matured. And the balance sheet shrinks. So the significance is not that they're dumping bonds, because they're not going to sell a single bond. The significance is that they are not buying new ones. Now at the margin, that still affects the market. The Fed has been the biggest buyer of new treasury issues for the last eight years. In recent years, they've been buying as much as 30% of all the treasury bonds. So of course, the treasury issues bonds all the time to cover the deficit right? So we've had these huge deficits. They were over a trillion dollars back in the Obama days. They're now down to around 400 billion, but that's still a very big number as a percentage of GDP. And the Treasury covers those deficits by issuing notes and bonds. Well, the Fed has been buying 30% of them. So it's like any market. You take the biggest buyer out of the market, what's going to happen? Well prices are going to fall, which means that interest rates go up. So that's going to be a very strong headwind for the economy. Now the Fed is trying to pretend that that's not going to happen. And I know that sounds ridiculous, but here's the way they're spinning this whole thing. The Fed is saying, "Look, our policy tool is interest rates." When they were zero, they didn't have any flexibility. They couldn't go below zero. I mean technically, you could go to negative interest rates, but the Fed never did. The evidence is pretty good that negative interest rates don't work anyway. So let's just put negative interest rates off to one side for the time being. They are a tool in the toolkit, but not a tool that the fed has ever used or is planning to use. So put negative interest rates to one side. Treat the zero interest rates as a hard boundary. When they were on the boundary, they couldn't really do anything with interest rates. They couldn't cut them anymore. They certainly weren't going to raise them at the time. But now they've got them up to 1%. We've had four interest rate hikes. December 2015, December 2016, March 2017 and June 2017. So, we have four rate hikes behind us – 25 basis point each. So that actually got rates up to 1%. Now they're indicating they're going to raise them some more. I don't see that until December at the earliest. Maybe not even then, but I don't think they're going to raise rates in September. But they're hinting that they will. They think they can raise them. If somehow we dropped into a recession, they wouldn't do this right away, but they could cut them. So, the Fed feels that the interest rate tool is now in use again. They can raise them or cut them. They've got a little bit of flexibility both ways. So, they don't need to use the balance sheet. So what they're saying is, "Okay, starting now, we're not going to sell any securities, but we're not going to buy new ones. The amount that we're not going to buy." It's kind of a strange concept, how much are you not going to buy? Or in other words, what's the ceiling on the amount that you're prepared not to roll over. And it's going to start low. They're going to start at 10 billion a month at six billion in treasuries and four billion in mortgages, but they're going to ratchet it up. Every three months that number's going to go up and up and up. Until they get to the point where, and this is the number you mentioned, it's $50 billion a month broken into 30 billion in treasuries, 20 billion in mortgages. But it's 50 billion a month times 12 months is 600 billion dollars a year. So sooner than later, meaning late 2018, early 2019, the Fed is going to not roll over $600 billion a year. Put differently, $600 billion a year in money is going to disappear. The Fed would like us to believe that that's not a monetary tightening, that that's not going to have any impact on the economy. That's nonsense. How could they tell us for eight years that Quantitative Easing was stimulative, that Quantitative Easing acted through the portfolio channel sect by pumping up stock prices, by pumping up house prices, making it good collateral for loans. This would increase funding and spending, have a wealth effect. All this wonderful stuff. By the way, a lot of what I just said is nonsense. I mean I'm describing how the Fed thinks about it. It's not necessarily how I think about it. Nor do I think all that stuff works the way they think it does, but that's what they told us. That Quantitative Easing would have all these wonderful effects. Well how come Quantitative Easing has those good effects, but Quantitative Tightening or QT doesn't have any bad effects? That seems ridiculous. So, little by little, they're going to work their way up to $600 billion a year of money that disappears, that reduces the base money supply (M0), but somehow, we're all supposed to pretend that that's going to have no impact on stock prices or housing. I think that's nonsense. So, it's a very big deal and the Fed says they wanted to run on background, wants to pretend that this not rolling over the 600 billion a year is going to run on background, pay no attention to that man behind the curtain. We're not going to use it as a policy tool. We're just going to do interest rates up or down over here, so ignore this. Well they can say that, but the market's not going to ignore it. The market understands what's going on. And it will have this tightening effect as you described. So, the Fed is blundering once again. They can't seem to get anything right. That's not really surprising when you have the wrong models, obsolete models, you'll get the wrong policy every single time. But the economy's weak. It's getting weaker. We may be in a recession sooner than later. The market looks vulnerable and now the Fed wants to launch this major tightening program. I think it's nonsense to think that won't have some very bad effects. Mike Gleason: Switching gears here a little bit. I want to talk about the dollar. It's long been said that the U.S. dollar is significantly boosted and allowed to maintain its status as perhaps the world's most reliable fiat currency or the tallest midget at the circus, so-to-speak, because the world's financial system is built around the dollar. It is used to settle trades of oil and practically everything else. Now you've written a lot about currency wars and how this type of thing plays out and what goes on behind the scenes with all of this. And you just know people like the Chinese and Russians would love nothing more than to see the Petro-dollar taken out and replaced. Is our US dollar going to retain its Petro-dollar status over time here, Jim. Jim Rickards: I don't think so. There's a very famous line from an Ernest Hemingway novel. The novel is The Sun Also Rises. It's basically two guys, they're having a drink at the bar and the one guy's recently gone bankrupt. The other guy's a little incredulous and he says, "Well how did you go bankrupt?" And his very famous answer was, "Slowly at first, then quickly." Meaning, with any exponential algorithm or any exponential function, it starts slowly at first and then quickly. In other words, it's the famous story of the courtier to the emperor of Persia, who did the emperor a service. The emperor was so pleased, he said, "I'll give you anything you want. What do you want?" And the guy took out a chess board and he put one grain of rice on one corner. He said, "I'd like you to double the rice every square, so I'll get two grains of rice on the second square, four grains of rice on the third square. And eight grains of rice on the fourth square, etc. around the board. And that's how much rice I want." So the king goes, "Done. You got it." And then of course, he didn't do the math. That's two to the 4th power because there's 64 squares on a board. And then the king's administer came back later and said, "That's more rice than the entire kingdom." So, it's an example of how starting with a grain of rice, you can bankrupt a kingdom when you have any kind of exponential effect going on. So, with regard to the U.S. dollar, yeah, the dollar is 60% of global reserves today. It's 80% of global payments today when you look at all bank wire transfers and purchases of securities and currency trading and global trade, etc. No doubt that it is used to price oil and a lot of other things. So, no doubt that the dollar is the dominant global reserve currency today. But I see at least seven or eight different, very powerful threads. Those grains of rice are going two, four, eight, 16, 64, 128 and so forth, leading to the demise of the dollar. So what are they? Well number one, is gold. I think the China gold acquisition story is pretty well known. The Chinese officially say they have about 800 tons of gold. By the way, all these numbers I'm going to recite, these are all government gold. I'm not talking about private gold, which is a separate area, also important, but just government gold. China says they have about 1,800 tons. But (there’s a) very good reason to believe, based on Chinese mining output figures, Chinese gold imports, activities of People's Liberation Army, which moves the gold. I've been to China recently. I met with the top gold banks in China. I've also been to Switzerland recently and met with refiners there who actually sell gold to the Chinese and based on a lot of sources, it looks like they probably have more like maybe 4,000 tons, maybe even higher than that from all it's probably higher, maybe 5,000 tons of gold. Russia is a lot more transparent than China, but they have tripled their gold reserves in a little over 10 years. In 2006, they had about 600 tons. And now they just passed 1,700 tons. We just got the numbers for May. That may not sound like a lot compared to the 8,000 tons that the United States has, officially 8,133 tons, but remember Russia's economy's only 1/8th the size of the U.S., but they have almost one quarter the amount of gold, which means that their gold to GDP ratio is double the United States. If you had to back up your economy with gold, Russia would have twice as much as the United States again, all relative to the size of their economy. China is about on the par with the United States. It seems determined to pass the United States. So, two of the most powerful countries in the world are buying all the gold they can lay their hands on. The way I put it to people is, you can draw two conclusions. Number one, the Chinese and the Russians are really dumb. Or, they see something that you don't. They see something that most people don't see coming. I've spent time in Russia and China, they're not dumb, meaning they see something that most people don't see. And they're preparing for a post dollar world or a world in which the confidence in the dollar is greatly eroded. So that's one thread right there. Beyond that, we have crypto-currencies. And I don't want to get into Bitcoin and all that, but that's a whole separate subject. It's a long subject and a difficult one for a lot of people. But in all my discussions, I've always separated block chain from bit coin. Block chain is the technology behind the distributive ledger and how you actually account for the bitcoins. Bitcoin is the specific digital currency. And there are others out there. Bitcoin may or may not be the future though. That remains to be seen. I have my doubts, but others disagree. But there's no question that block chain technology has a bright future. Russia is exploring that. If you were Russia, then you were the central bank of Russia, why would you want to be talking to the founder of Etherium or other experts on block chain technology. Well one answer would be that you're building a digital currency alternative to the dollar that the U.S. cannot hack or disrupt, because right now everybody's vulnerable to dollar sanctions. So, Russia doesn't love the dollar. They don't love the United States, apparently. But when they sell their oil on global markets, they get paid in dollars. Now they then take the dollars. They do stuff with them. Sometimes they buy gold. We talked about that, and that they store the gold of Russia. They don't store it in New York by the way. Or they can buy U.S Treasury securities and they have some of those. They can buy European or Euro denominated securities, German government bonds – they have some of those etc. or they can put it into their sovereign wealth fund. So, there are a number of things they can do with the money, but they always start with dollars. And when you start selling dollars for euros, or buying gold, sending the dollars to a Swiss refinery, getting the gold in return, etc. you're trapped in this dollar payment system that I was describing earlier, where all of what is called the message traffic – I pay you, you pay me. And we do it through banks. How is that actually done? Is it through these MT forms on Swift MT stands for message traffic. That's how we make irrevocable transfers. Well the United States has a choke hold on all that. We definitely have a choke hold on Fed-wire, which is the dollar payment system. And through our allies and out intelligence services, we have a choke hold on Swift, which is the international payment system. Russia is very uncomfortable having to transact through a system that the United States holds in its grip. It's like you're in intensive care and you're on oxygen and your worst enemy has his hand on the oxygen supply. They can cut it off anytime they want. So Russia is building alternative payment systems. It's not enough to try to get out of dollars into gold. You actually – if you're going to transact, if you're going to pay people for things – you need an alternative payment system that the U.S. does not control. Block Chain offers that. So Russia and China are pursuing that. There are there threads out there. The Chinese are very heavily diversifying into euros right now. Not all at once… none of these things happened all at once. But if you look around at the landscape, and Russia and China are buying gold. Russia and China are looking at digital payment systems, block chain type technology that the U.S. can't control. Russia and China are doing currency swaps. China's doing currency swaps throughout the world with Brazil, Switzerland, and with a lot of other countries. Saudi Arabia is looking at perhaps pricing Chinese oil in yuan. They've done currency swaps with China. They're working on these block chain based technologies. China's buying euros. This has the look of, you lose your status slowly, and then quickly at the end. So, yes, I think that the dollar will sooner than later lose its status as the dominant global reserve currency. It doesn't mean dollars go away. It does not mean that we wake up one day and, "Oh, gee. There's no dollars." It just means that it becomes less and less important, the U.S. loses its financial leverage, and the dollar may end up like the Mexican peso. If I go to Mexico, I'm going to get some pesos, because I need them down there for taxi drivers or tips or bartenders or whatever. So, it's a local currency, but I'm not going to take them back to the United States with me. Well, the dollar could get to the point where it's the local currency of the United States. You'll have some when you come here. And you and I might get paid in dollars or spend money in dollars or whatever, because we live in the United States. But it loses its global reserve currency status. And that's a very big deal in terms of the ability of the United States to run perpetual trade and budget deficits without having to suffer inflation or suffer devaluation or the consequences that countries like Argentina know all too well. And we haven't even talked about the SDR, which is another alternative to the dollar. I've been talking about Russia and China and block chain and gold and euros, but the SDR is out there as well. The last issuance of SDRs was fairly recent in 2009, in the aftermath of the financial crisis. And then the next global liquidity crisis, which again, you can foresee and expect. Independent of the decline of the dollar. That's something that's just happening in front of our eyes. But a global liquidity crisis could happen at any time. And it begs the question. How do you re-liquefy the world? How do you put out or end a global liquidity crisis? The last time it was the central banks bailing out Wall Street and really bailing out the world, but going back to the earlier part of the interview, Mike, when we talked about the Fed reducing their balance sheet. Well the way the fed dealt with it last time was by expanding their balance sheets. From 800 billion to 4.5 trillion. Printing money in other words. Well what if a global liquidity crisis hit soon or maybe even next year long before the Fed reduces their balance sheet? Why is the Fed reducing their balance sheet? Why do they care? Why not just keep the 4.5 trillion? What's the big deal? Well the answer is they're at the outer limit of a confidence boundary. They're at the outer limit of how much money they can print before people start to question the value of the money itself. So they want to get it down to two trillion, so they can go back up to 4.5 trillion again if they have to. In other words, if here's another liquidity crisis. And you start at maybe two trillion, you can take your balance sheet up to five trillion with, that would be QE4 and QE5 and QE6. And that would help to maintain the U.S.’ dominance. But here's my question. What if the liquidity crisis hits before the Fed can get their balance sheet normalized, which in my view is very likely. Well in that case, you need another source of liquidity, and that source would be the IMF issuing SDRs and that would be the end of the dollar. So the threats are everywhere. They could come from a lot of different directions. In fact, all these things will tend to converge, each one will amplify the other. But they all point in the same direction, which is the devolution in confidence in the value of the dollar and much, much higher dollar prices for gold. You’ve just heard part one of my two-part interview with Jim Rickards. Be sure to check back with us next Friday for the conclusion of this eye-opening conversation. Until then this has been Mike Gleason with Money Metals Exchange, thanks for listening and have a great weekend everybody.